Tomorrow night, the UFC will take over the American Airlines Center in Dallas, Texas with UFC 228. 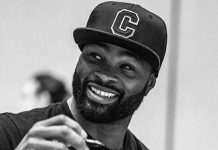 The card will be headlined by a welterweight title fight between champion Tyron Woodley and undefeated challenger Darren Till. 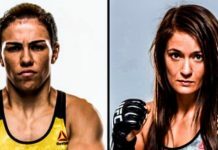 The card was expected to be co-headlined by a women’s flyweight title fight between inaugural champ Nicco Montano and fearsome challenger Valentina Shevchenko, but this fight was cancelled when the champion was rushed to the hospital on Friday morning. Other features of the UFC 228 main card include a featherweight bout between Zabit Magomedsharipov and short-notice replacement Brandon Davis, a strawweight contender bout between former title challengers Jessica Andrade and Karolina Kowalkiewicz, and a welterweight scrap between Abdul Razak Alhassan and Niko Price. The undercard, meanwhile, is set to feature names like Carla Esparza, Tatiana Suarez, Jimmie Rivera, John Dodson, Aljamain Sterling, Cody Stamann, Diego Sanchez and Craig White. 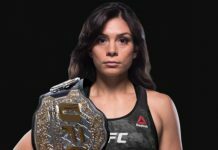 On Friday morning, the fighters scheduled to compete on the UFC 228 bill — minus Nicco Montano — stepped onto the scale to weigh in for their looming battles. 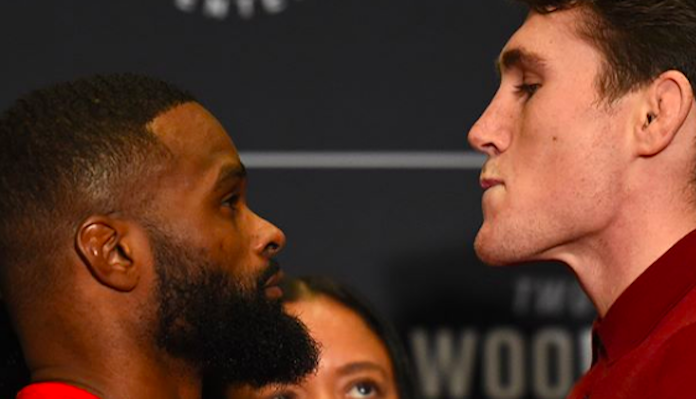 The biggest story of the weigh-ins, barring Montano’s exit from the card, is that Darren Till tipped the scales a pound below his target at 169 pounds, while the champ Woodley needed a towel to make 170. He hit 171 on his first try. Zabit Magomedsharipov was initially believed to have missed weight by half a pound, but this was subsequently attributed to a scale error. Here are the official UFC 228 weigh in results (h/t Aaron Bronsteter of TSN). 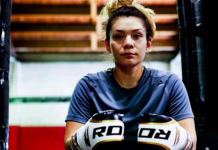 Nicco Montano vs. Valentina Shevchenko (124.5) – fight cancelled due to Nicco Montano’s hospital visit. Montano did not weigh in. Kamaru Usman also weighed in, in case a main event fighter needed to be replaced. He tipped the scales at 169. Which UFC 228 fight are you most excited for?